Casual is my style and always has been. My mother took great pains when I was growing up to make me look like a sweet little girl and a lovely young lady, but I was always for kicking off those dresses and getting into something more comfortable. But I do appreciate her efforts and I can dress up if I want to. We’re a far cry from the way I grew up. Lifestyles have changed over the past decades to the place where just about anything goes. You may see an occasional sign at a restaurant that say you must have shoes and a shirt, but that’s about it. Jeans are acceptable everywhere except some country clubs and even they make exceptions all the time. After all, how do you differentiate between jeans you work in the yard in and your $100+ designer jeans and who is going to tell someone their jeans aren’t nice enough? I’ve even seen jeans in church at funerals and weddings, not to mention regular worship services. Ministers got to the point that they just wanted people in the pews and they weren’t going to quibble about what they were wearing. Hats are another thing. My grandfather wore a hat always, but he removed it in the house or at dinner or church. Everyone, men, women, kids, wears ballcaps now and few remove them very often. Hat Head is the excuse. They still remove them for the National Anthem and in church. That’s about it. Sometimes in restaurants, very fancy ones! At times in my life, we didn’t go out without little white gloves. 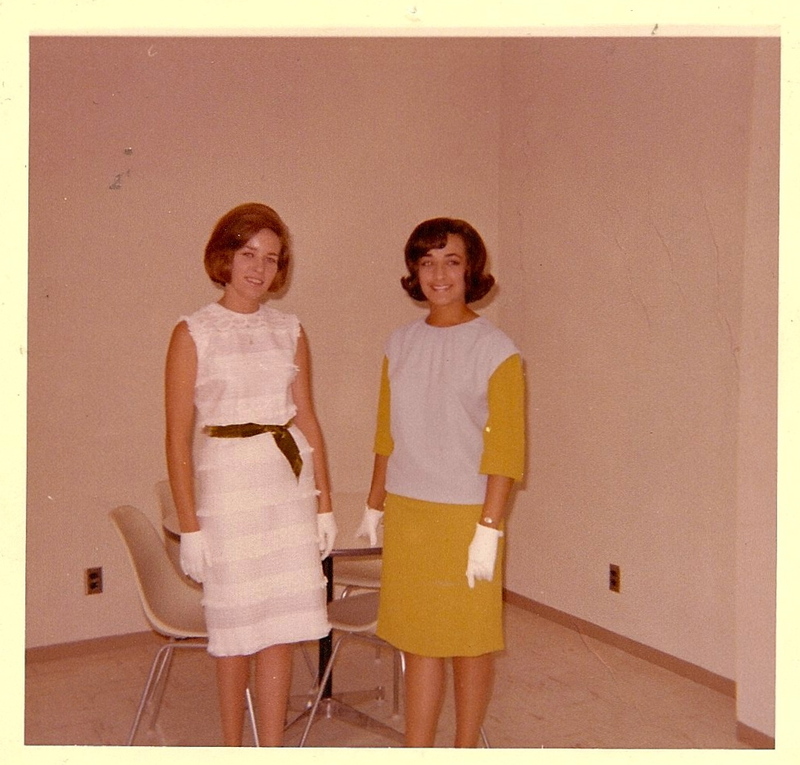 I can remember having white white white cotton gloves, probably bleached clean by my mother, to wear when I went shopping downtown or to luncheons with my friends when we had dressy parties. 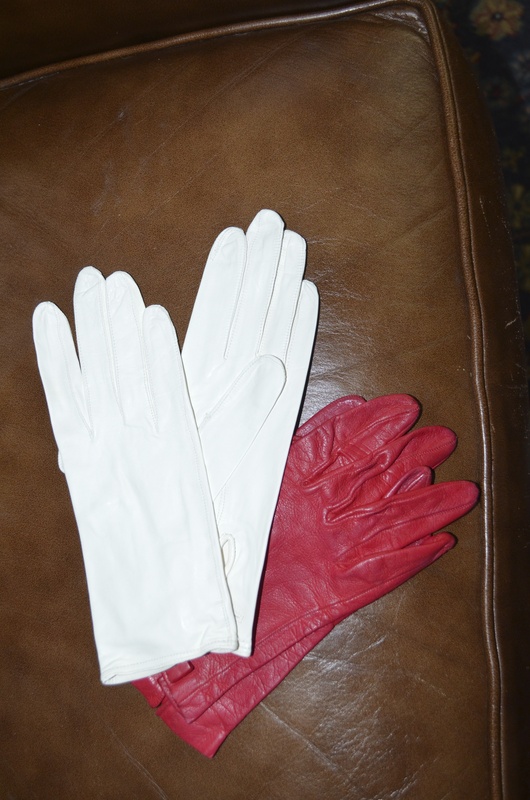 As I got older, I advanced to kid leather gloves, even my favorite red ones to go with the white. All our mothers were trying to teach us social graces. I don’t remember when it ended but here’s a picture of me getting ready to be interviewed for a beauty (Hah!) contest at OSU when I was a sophomore in 1964. Note the white gloves! Very proper! When I was little, we dressed up for luncheons and shopping downtown or plays or concerts or dinner in a nice restaurant. When I was in college, we dressed up for football games. Really. We wore skirts and sweaters to the games, no matter how cold it was. We wore skirts to class, too! On snowy days, we would put some slack under our skirts so we wouldn’t freeze walking across campus. Quite the fashion statement. Oh! We also wore hose, held up by girdles or garter belts, although my mother didn’t think those were very proper. I wore a girdle when I weighed barely 100 pounds and had no stomach. No wonder I laugh at Spanx today! Been there, done that and not doing it again. Ever! The 60s started the changes. I can remember teaching at OSU when the mini skirts came in and realizing you could stand at the front of the classroom and look right up every girl’s skirt. As the skirts got shorter, the rules relaxed and you could wear pants and then jeans. Fashions changed rapidly through the 60s and 70s and we were the generation that lived it, even as we married and raised families. We still dressed up to ride planes (heels and all), go to church, go to concerts, out to dinner. The gloves were gone, but you dressed up. The guys put on shirts, jackets and ties and the women wore hose and heels and skirts and makeup and had their hair done. There were social rules you had to follow after all. I remember a date specifically that I began to realize that the casualness I loved was permeating maybe too far. On our 25th wedding anniversary, my husband took me out to a very nice restaurant. We ordered champagne and a lovely expensive dinner. We were dressed up nicely for this special occasion in our lives. When I noticed that the guy next to us was wearing jeans, nice jeans, with his tie and jacket, I thought to myself that there really was nowhere you could dress up for a special night out. He didn’t spoil our evening, but it was jarring in a place where everyone else was pretty spiffy that evening. And, remember how casual I am, so it’s interesting that those social dos and don’ts were so ingrained in me that I even noticed it, much less remember it all these years later. There are practical reasons for everything, of course. It was expensive to have entire dressy outfits for our four children and I am amazed at the price of my huge grandsons’ shoes alone. They can’t afford to have very many styles since their feet seem to be endlessly growing. At least one of them is past a 13 adult size now which equates to expensive. Another time, almost twenty years ago, some friends of mine met for lunch at a retirement home where one of us was working as a development officer. It was a lovely place and we dressed appropriately, but we didn’t match the lovely women who lived there and came to lunch dressed like the ladies they were. They had their makeup on and wore suits (jacket, blouse and skirt) and dresses and hose and maybe even girdles and carried their handbags on their arms like Queen Elizabeth. At the time, I remarked that our generation would probably come to lunch in sweat suits. Lordy! So, here I sit in yoga shorts and a t-shirt, which I may wear all day no matter where I go. Or I may dress up, which implies I put on leggings and a nice top and nicer sandals. That garb would work where I live even if I had to go to a concert or church. Adding earrings and a necklace or scarf would really make it pretty impressive. All about the accessories. A guy probably would put on a nicer shirt and pressed shorts…maybe. We sold our house yesterday, and last week we moved all our remaining “stuff” to storage. Furniture, photographs, kitchenware, clothes. I had a hanging box for my clothes, and packed up some dresses, and winter clothes, thinking, I won’t need any of these for a while – I’ll be living on a boat once I leave Tulsa. The only shoes I packed were a really pretty pair of sparkly heeled sandals. Shorts, camisole tops and flip flops are what I wear these days. The next day I received a wedding invitation. We’ll still be in Tulsa for a few weeks, and we’ll be able to attend. We have no idea as to which one of the two storage lockers we have rented contain my clothes box, or the other box that has the shoes nor where in the locker it is. The perfect dress and shoes for a summer wedding are in there somewhere. The story of our lives. Always have to be ready to dress up whether we like it or not!